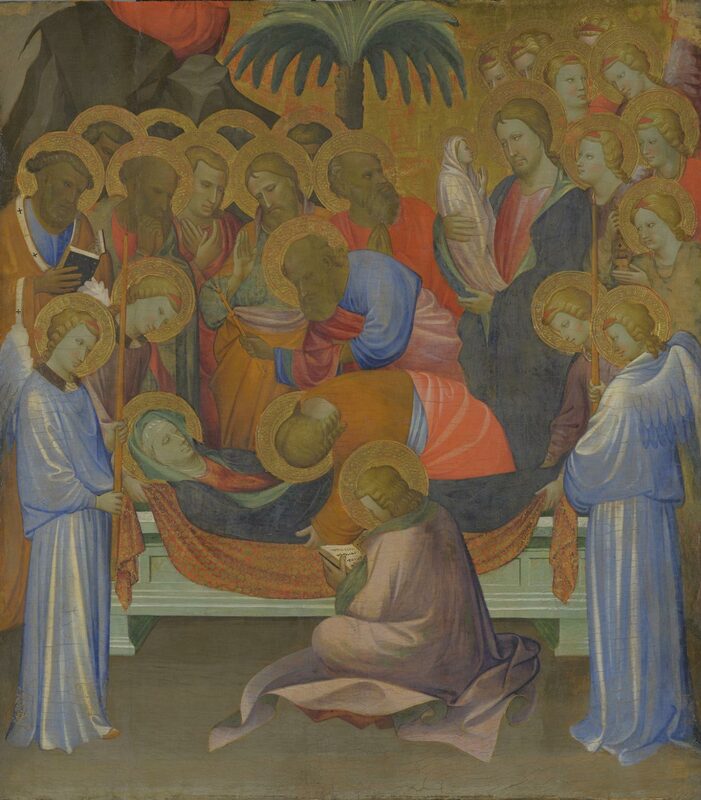 Two angels, aided by a young apostle, lower the Virgin's body into the tomb, while on the right Christ, accompanied by a host of angels, gathers her soul in his arms. Of the apostles looking on, only the bearded man with his hands clasped in prayer seems to note Christ's presence. He may be Dionysius Areopagite, the disciple of Saint Paul who, according to the Golden Legend by Jacopo da Varazze (c. 1267-77, Translated and adapted from the Latin by Granger Ryan and Helmut Ripperger ed. London, 1941, p. 451), was said to have been present at the Virgin's burial and to have given an account of it in his Book of the Names of God. If the figure is in fact Dionysius, this would account for the presence of thirteen, as opposed to the usual twelve, apostles in the panel. Saint Peter is the man on the left wearing a white stole with crosses, a liturgical garment reserved for popes. The older apostle using an aspergillum to sprinkle the Virgin's body with holy water may be Andrew, who is traditionally bearded and balding. On a rocky promontory in the upper left, the lower part of the red mantle of the kneeling apostle Thomas is visible. The rest of his figure can be seen in the upper section of the center panel in the Fogg Art Museum, which shows the Virgin giving Thomas her belt (see Cambridge, Harvard University Art Museums, Fogg Art Museum, Gift of Friends of the Fogg Art Museum Fund, no. 1920.1). 1 The two panels have been installed together and are exhibited as a unit at the Philadelphia Museum of Art and the Fogg Art Museum on a rotating basis. Bernhard Berenson (1913) attributed the panel in the Johnson Collection to the Master of the Bambino Vispo, who has since been identified as Starnina. This attribution has been accepted by all authors except for Jeanne van Waadenoijen (1983) and Cornelia Syre (1979), who both thought it and the other panels of the altarpiece were by a follower of Starnina. The iconographical similarities of the Starnina and Puccinelli altarpieces may be tied to the spread of the Augustinian reform community of the Canon Regulars,7 founded in 1401-2 by Bartolomeo Colonna and Leone Gherardini da Carate in suburban Lucca. On October 2, 1406, the local bishop, Nicolò di Lazzaro Guinigi, dispossessed the Benedictine nuns of the Monastero dell'Angelo and replaced them with a group of reform canons,8 and two years later Santa Maria Forisportam became part of the same reform.9 From this point the two communities were closely connected, and in 1512 the canons of the Monastero dell'Angelo moved their headquarters to Santa Maria Forisportam. Starnina's altarpiece could well have been commissioned after the reform of Santa Maria Forisportam in 1408. It would not have been unusual to ask the artist to use Puccinelli's altarpiece there as a model. A date around 1408 also accords with the style of Starnina's altarpiece, which most closely resembles his murals of 1409 in Empoli.10 The apostle Andrew in Empoli and the apostle sprinkling holy water in the altarpiece are nearly identical. As noted by Andrea De Marchi (in Filieri 1998, p. 269), another indication for the date is the resemblance of the two lower angels in Lorenzo Ghiberti's stained-glass window of the Assumption in Florence cathedral, installed by June 1405.11 The canons of the Monastero dell'Angelo may have ordered their altarpiece shortly after they took over the monastery in October 1406, or after the reform encompassed Santa Maria Forisportam in 1408. If the painting came from San Michele in Foro Lucca, it would have been begun as early as 1404. Carl Brandon Strehlke, from Italian paintings, 1250-1450, in the John G. Johnson Collection and the Philadelphia Museum of Art, 2004, pp. 391-398. 1. On this subject, see Neri di Bicci, Philadelphia Museum of Art, John G. Johnson Collection cat. 27. The association between the Johnson and Fogg panels was first recognized by Francis Mason Perkins ["Some Recent Acquisitions of the Fogg Museum." Art in America (New York), vol. 10, no. 1 (December 1921), p. 44 n. 2]. 2. Alvar González-Palacios ["Posizione di Angelo Puccinelli." Antichità viva (Florence), vol. 10, no. 3 (May-June 1971), p. 5] first made the association. 3. Andrea De Marchi (in Giovanni Romano. Da Biduino ad Algardi: pittura e scultura a confronto. Entries by Alessandro Ballarin et al. Turin, 1990. Turin, Antichi Maestri Pittori di Giancarlo Gallino, Ezio Benappi & C., May 12-June 23, 1990, pp. 17-23) first noted that the Kansas City and private collection panels came from the predella of this altarpiece. At the suggestion of Federico Zeri, Eliot W. Rowlands (The Collections of The Nelson-Atkins Museum of Art. Italian Paintings, 1300-1800. Kansas City, Mo., 1996, pp. 78-82) added the Presentation of Christ in the Temple to this group. 4. Berlin, Staatliche Museen, no. 1884; Miklós Boskovits. Gemäldegalerie Berlin: Katalog der Gemälde: Frühe italienische Malerei. Translated and edited by Erich Schleier. Berlin, 1988, plates 102-8, color plate i (detail). Then in the Ognissanti, Florence. 5. No. 1933.1017; Christopher Lloyd. Italian Paintings before 1600 in The Art Institute of Chicago: A Catalogue of the Collection. Contributions by Margherita Andreotti, Larry J. Feinberg, and Martha Wolff. Martha Wolff, general editor. Chicago, 1993, color repro. p. 227. 6. Diane Finiello Zervas, ed. Orsanmichele a Firenze / Orsanmichele Florence. Texts by Paola Grifoni et al. 2 vols. Mirabilia italiae, 5. Modena, 1996, atlas vol., color plate 798. 7. After 1446 the Canon Regulars were known as the Lateran Canons. See Carlo Egger in Dizionario degli istituti di perfezione. 10 vols. Rome, 1974-2003. vol. 2, 1973, cols. 101-7. 8. Giovanni Barsotti. Lucca sacra: guida storico-artisticoreligiosa di Lucca. Lucca, 1923, pp. 180, 226-27. 9. Barsotti 1923, p. 180; Giorgio Giorgi. Le chiese di Lucca: S. Maria Forisportam. Lucca, 1974, pp. 21-24. 10. Empoli, Museo della Collegiata di Sant'Andrea; Luciano Berti and Antonio Paolucci, eds. L'età di Masaccio: il primo quattrocentro a Firenze. Milan, 1990. Exhibition, Florence, Palazzo Vecchio, June 7-September 16, 1990, color repro. p. 89. 11. Richard Krautheimer in collaboration with Trude Krautheimer-Hess. Lorenzo Ghiberti. Princeton Monographs in Art and Archaeology, 31. 3rd ed. Princeton, 1982, fig. 7. Rudolf Hiller von Gaertringen. Italienische Gemälde im Städel, 1300-1550: Toskana und Umbrien. Edited by Herbert Beck and Jochen Sander. Kataloge der Gemälde im Städelschen Kunstinstitut Frankfurt am Main, 6. Mainz, 2004, pp. 200-201 and n. 70. A. Upper center panel of an altarpiece: Virgin Mary Giving Her Belt to Saint Thomas the Apostle. Cambridge, Harvard University Art Museums, Fogg Art Museum, Gift of Friends of the Fogg Art Museum Fund, no. 1920.1. B. Lateral panel of an altarpiece: Saints Michael Archangel, James Major, and John the Baptist. Lucca, Museo Nazionale di Villa Guinigi, inv. 287. C. Lateral panel of an altarpiece: Saints John the Evangelist, Peter, and Paul. Lucca, Museo Nazionale di Villa Guinigi, inv. 288. D. Predella panel of an altarpiece: Adoration of the Shepherds. Turin, private collection. E. Predella panel of an altarpiece: Adoration of the Magi. Kansas City, The Nelson-Atkins Museum of Art, Gift of the Samuel H. Kress Foundation, no. F61-60. F. Predella panel of an altarpiece: Presentation of Christ in the Temple. Private collection.